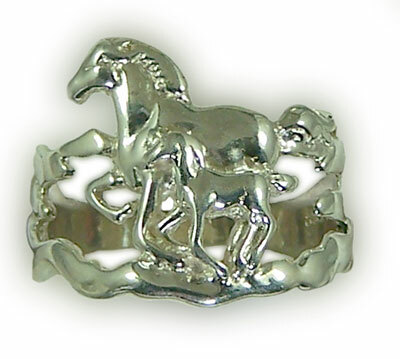 "Mare and Foal Ring in Sterling Silver"
The Gorgeous Horse, your source for custom equestrian jewelry. Check out the classic mare and foal in a custom contoured band with openings in the front. This would feel great around your finger and it's great to look at. Make the foal yellow gold and the mare white gold, or put some emeralds and sapphires in the band to make it look earthy, a ruby in the eye. Dimensions: 18mm wide tapering down to a 4mm shank. Available in 14 kt yellow gold, 14 kt white gold, or sterling silver. Request your size by using our comments and request box below.